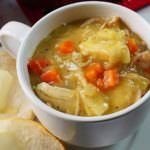 Chicken and Dumpling Soup is a comforting meal that fills your home with an enticing aroma. But what if you don't have all day long? Then let's take a shortcut or two - you won't loose the flavor and your family will still be lined up begging for more! 1/2 teaspoon tumeric Tumeric is optional, but I love using it in chicken soup. In addition to the beautiful color, it's full of antioxidants - super good for you! If you're using rotisserie chicken, pull meat from the bones, remove skin and dice or shred. You'll want about 1 1/2 cups chicken meat. Using a large stock pot, heat the olive oil & butter over medium heat. When the oil is hot, add the onions, carrots, celery, red pepper flakes & thyme. Sauté' until the vegetables are soft stirring often - about 5-6 minutes. Increase the heat to medium high and sprinkle the flour over the mixture. Continue to cook for another minute. Slowly pour in the chicken stock. As the mixture comes to a boil it will thicken. Add in the shredded chicken. Lower the heat to medium low. Test for seasonings. If needed add salt at this time to taste. Open the can of biscuits - remove three biscuits and slice into strips or a small dice. Keeping in mind they will triple in size when they are cooked. Sprinkle them over the top of the soup in one even layer (very important! ), do not stack them on top of each other. Cover & simmer for 15-20 minutes until the biscuits are cooked thru. The rest of the biscuits....you guessed it! Cook according to package directions and serve them with your meal.